The sports technology suite of PrePlay free apps allows you and your Sports Techie friends to predict every play of every game and earn currency while watching live sport broadcasts. MLB PrePlay is off to its second year and is the official Major League Baseball prediction game. The New York startup had 25 million predictions in 2013 and is anticipating a whopping 100 million in 2014. The Sports Techie community blog was able enjoy the second screen digital fan experience of their PrePlay beta and live app environments on our iPhone 5S and Samsung HD flat screen TV during the opening night Sunday Night Baseball (SNB) game on ESPN between the Los Angles Dodgers and San Diego Padres at Petco Park. Roy Maultasch, Community Manager, PrePlay Sports, was hired at the beginning of the month, wrote the apps FAQ, and educated me during opening day about their company and sports tech applications that projects distinct plays using proprietary algorithms. PrePlay is a small, independent game studio in New York that produces sports prediction mobile games. Their live prediction contests are the exact kind of fan affinity mobile and social activation opportunities that potential partners are eager to know about. The second screen space where fans engage with television together with mobile devices is fast-becoming attractive to corporate sponsors. They have the ability to scale and work together with small bar owners or large stadium venues. Fans get to compete together and crown a single champion at the end of the season who gets all the bragging rights. The sports technology company has 20 full time employees. Two rounds of financing have raised a total of 8.5 million. MLB PrePlay is their most downloaded app. 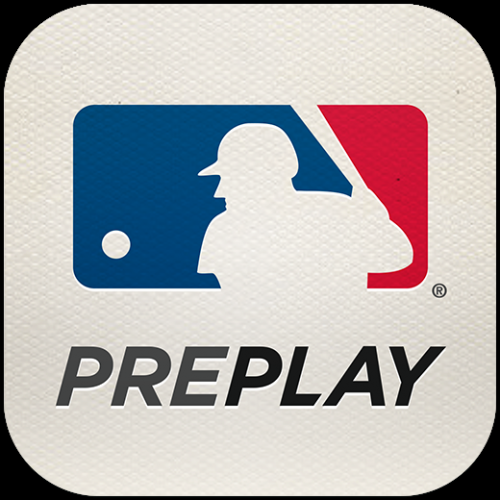 This is not an MLBAM company but PrePlay is an official partner of MLB and the NHL. You can find them featured at MLB.com on the Mobile and Fantasy tabs. Besides baseball, football, hockey and soccer apps are available to play. CEO and Founder, Andrew Daines said, “Our users are educated fans, who always crave more predictions.” He was inspired at Cornell to create a prediction system and as luck would have it, he had some like-minded friends from Paris who jumped aboard to help make it so. His role as Moderator is to access the admin website and monitor all games and fan comments, five times a week, often past 2 AM EST. I am the former Wetpaint Moderator for the N.Y. Giants, Houston Rockets and HBO Entourage, plus DWTS and MSN, so I understand Roy’s work responsibilities and challenges. PrePlay uses a language filter to help maintain a civil chat room. I asked Roy what generation he represented. He said, the “Phone in hand gen,” or, “the lazy gen.” He feels that college and high school aged people grew up with a phone glued to their hand and has heard his generation described as lazy. I am one to tell you that if Roy represents this new generation, PrePlay and the world are a better place because he is friendly, smart and eager to help, like many fellow Sports Techies. Predictions begin at the beginning of an inning, predict the pitch count and whether a team will score on not. Predicting a triple , the most exciting play in baseball, is worth 900 points while a home run is worth 500 points. Bases loaded guesses and grand slams get you the largest payouts. Predicting outs does not score very high. Special categories and achievements also provide currency. I like the fastest pitch which requires some research to help predict how fast a Felix Hernandez fastball crosses the plate. WEEKLY CHALLENGES are every week and starts a new race for the elusive Triple Crown. You win, you wear the crown… but be prepared to defend it. Pick streaks are central to scoring. Streaks get you more tickets at 3, 5 and then increments of 5. POWER-UPS pack a more powerful punch with your predictions by applying any one of six powerful strategy items. Using power ups during a streak can score big points. Shields protects a streak and like power-ups, have a one-time use. In app purchases can be made for additional tickets and power ups. Match Up’s are a head-to-head prediction competition at the top of each inning. It costs 250 tickets and the winner earns 750 tickets. My match up against user RoyParker12 ended in defeat. The Bowman (Topps) Top Prospect Level Sponsorship is an example of new digital real estate meeting the right sponsor, a nice ROI. I asked whether iBeacon tech was part of their stadium detection technology using location based data and he was not certain. The apps smartphone push notifications entice you to open up their app and play ball. Most advertising will direct fans to the App Store. It appears MLB.TV and PrePlay are not cross promoting at this time although they are partnered with MLB Network. I told Roy that spending ad dollars with MLB.TV makes sense because PrePlay users can use their video and audio streams to play alongside. As they expand, I was curious as to their localization priorities with their software and whether there was a Spanish or Japanese version coming out anytime soon. Roy said this was not in the current development pipeline, for now everything comes in English. I mentioned to Roy how the Accuracy Percentage vs. Point Totals criteria might need to be reevaluated for Business Development opportunities. Roy felt that by playing it safe, i.e.. predicting a lot of outs, rather than predicting big ticket plays, is the not the best way to play. While total points are important, I feel the accuracy percentage is as important because should two users finish with one million points, a tie-breaker could be whoever has the best accuracy. Also, the most accurate predictor, who meets an inning minimum, could be crowned by the category sponsor. Look for more MLB swag, MLB shop and gift cards, plus weekly gifts, over the course of the season. I wondered whether the All-Star game was being targeted and at this point it is not. Roy tossed out that predicting the home run derby is one MLB PrePlay idea he believes has merit. 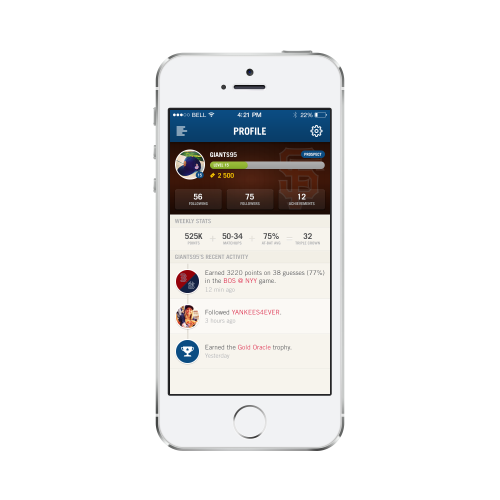 Founded in 2010, PrePlay, Inc. is a leading provider of mobile games, technology, and services to professional sports leagues, teams, broadcasters, and brands. 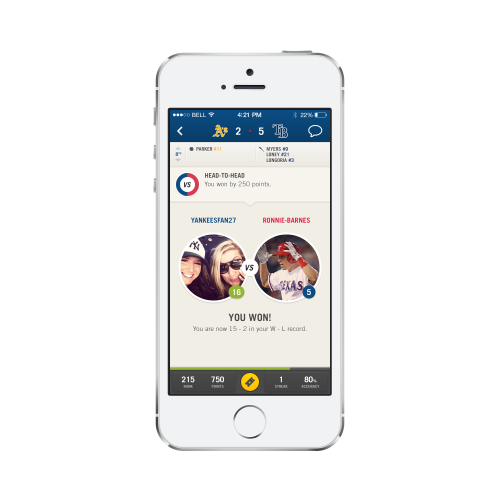 The company develops and publishes products for the web, iOS, and Android that engage sports fans in real-time prediction games. Every day, fans make thousands of sports predictions and chat messages on our platform and spend hours on end enjoying the unique PrePlay experience. For more information, please visit www.preplaysports.com or follow us on Facebook or Twitter. Sports Techie, Whether you play during a SNB game on ESPN or on a Friday night when 15 games are played, this robust app has the ability to keep up with your prediction pace and then some. The touch screen moves left to right. The UI has easy to use circles that count down prediction questions. 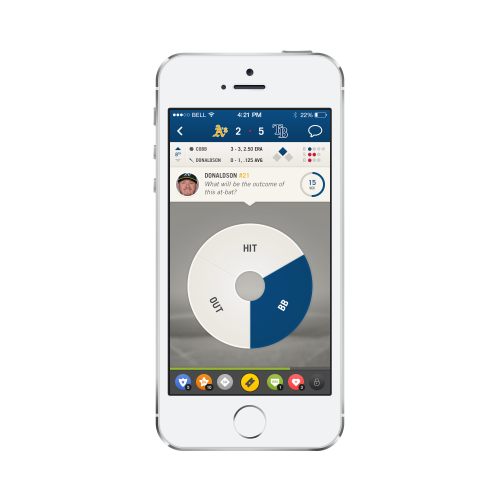 I liked using the app to keep track of scores and play-by-play even when not making predictions. The lively chat room is where you will find Roy or other PrePlay Moderators so be sure to say hi and follow them. The global economy has resulted in the PrePlay office in New York City receiving their tech support via Paris. PrePlay social media is on Facebook, Twitter, Instagram, and YouTube, and are important components to the PrePlay branding and community growth. CBS Sports, Bleacher Report and T-Mobile are other sportsbiz clients. Your username and password for MLB PrePlay will also give you access to their other apps, which you can check out here. 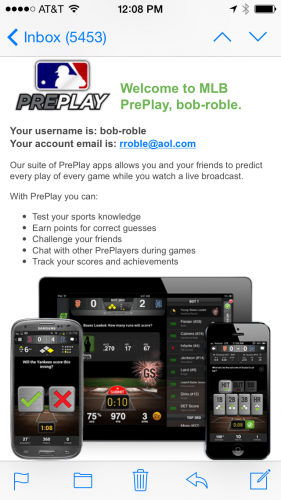 Download MLB PrePlay by Pre Play Sports, LLC here and friend me at Bob Roble. Need more tips on how to advance!